I hear that food prices are on the rise, which is not good news. My menu planning is geared around my budget and I do find that if I simply pick recipes with less ingredients, it really helps to keep my costs down. Simple, but true! I am also trying harder to stock up on meat when it's on sale. What do you to do stick to your budget? 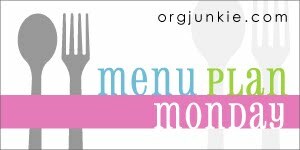 Here's my menu plan this week and you can check out more menus at Org Junkie.